Explore complex, multi-actor systems in which one factor influences all other factors. For instance, how innovative energy technologies merge into the existing energy system, or how new transport possibilities impact current processes. Armed with this information, learn to decide whether they should be further developed, consider possible negative results and weigh associated costs. There are multiple ways to make decisions, but one way proven to be very useful is the analytical approach – a methodology for making the problem explicit and rationalising the different potential solutions. In short: analysis based support of decision making, design and implementation of solutions. Creative Problem Solving and Decision Making as a course teaches you this method. This course introduces each technique and applies each technique to a case. Ultimately, the combination of these techniques provides a coherent analysis of the problem. This course has been awarded with the 2015 Open Education Award for Excellence in the category ‘Open MOOC’. Analytically based support of decision-making, design and implementation of solutions. How to apply tools like actor analysis, causal modeling, goal trees and means-end diagrams, problem diagrams, uncertainty, decision support and score cards. 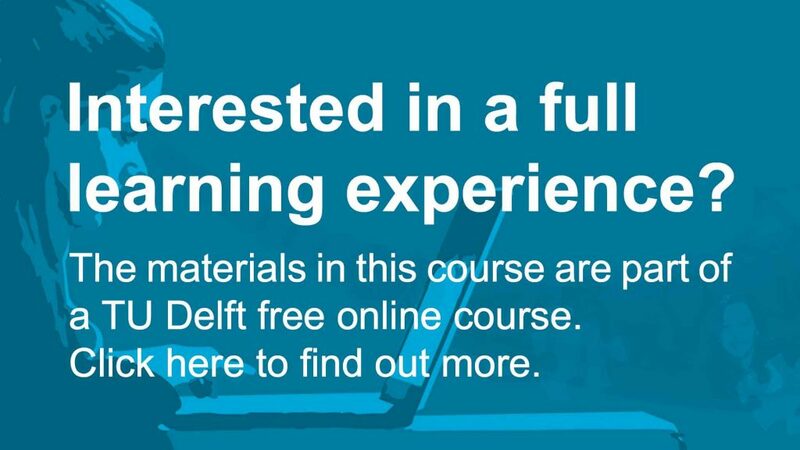 Creative problem solving and decision making I by TU Delft OpenCourseWare is licensed under a Creative Commons Attribution-NonCommercial-ShareAlike 4.0 International License. Based on a work at https://ocw.tudelft.nl/courses/creative-problem-solving-and-decision-making/.